If you visit any of the communities along the lonely stretch of highway in northern British Columbia, you will eventually hear about the chilling fate of several missing and murdered women—most indigenous—over the past two decades. These stories motivated Matt Smiley, a Hollywood-based filmmaker with family ties in a northern BC town, to make an award-winning documentary, “Highway of Tears”— as the notorious Highway 16 has become known. I interview Smiley about his documentary–now touring North America and the impact this story has had on people who come to watch the film and discuss the issues raised. 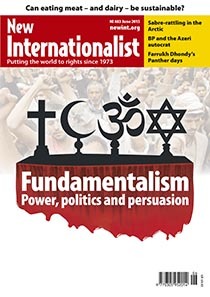 New Internationalist magazine, June 2015. This entry was posted on May 25, 2015 at 2:08 am and is filed under News Articles. You can follow any responses to this entry through the RSS 2.0 feed. You can leave a response, or trackback from your own site.